A flaugnarde is a rustic French dish made with fruit covered by batter that bakes into something between custard and a flan. Many types of fruit can be used. 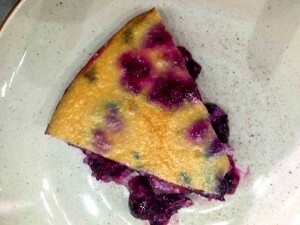 However, when black cherries are in the recipe, it becomes a clafoutis instead of a flaugnarde. This version uses a combination of fresh berries and is Paleo, soy free and dairy free. Spray a 9-inch glass pie pan with coconut oil spray. Gently toss mixed berries with minced ginger in a mixing bowl. Spread the berries onto prepared cookie sheet and roast in oven for 15 minutes or until the berries are just beginning to release their juices. Strain the berries using a fine sieve, reserving the juices. Discard the parchment paper lining and set the cookie sheet aside. Allow the berries to cool. Turn the oven down to 350 ° F.
Whisk eggs, egg whites, vanilla extract and agave in medium mixing bowl. In a separate bowl, blend coconut milk, almond milk, coconut flour, xanthan gum and salt. Slowly add the milk mixture to the eggs, blending until smooth. Spread the ginger roasted berries evenly in the prepared pie pan. Pour the egg batter over the berries until covered. Place the glass pie pan on the cookie sheet and place in the middle rack of preheated oven. Carefully pour water into the base of the cookie sheet to create a water bath. Bake in the oven for one hour, until the custard has firmed. Recipe by Jess Henneberry, a natural foods chef who creates and prepares nutritious meals for people with specific health needs. A graduate of the Natural Gourmet Institute in New York City, she specializes in making savory dishes for private celebrity clients following the vegan and Paleo diets. Henneberry also runs a meal delivery service and is a nutrition advisor and educator. Her website is jesahenneberry.com.